The 8 Best Skate Shops in Louisiana! While Louisiana is traditionally known for its Cajun food and jazz, did you know it’s also known for its half-pipes and bowls? With year-round temperate weather, Louisiana is an excellent skateboarding destination. Next time you need to gear up or get some repairs, check out the best skate shops in the state! With two convenient locations in Baton Rouge and Lafayette, you’ll understand what all the ruckus is about when you visit Rukus Board Shop. Open every day at each location, you’ll find quality name brands you know and trust for all your clothing, footwear, and skateboarding needs. Small Time Skates is located in Hammond, Louisiana, and is one of the best places around for skateboarding needs. The friendly and helpful folks there know what they’re talking about and don’t try to pressure you into buying what you don’t need. Whether you’re new to the sport or a seasoned lifer, stop by and look at the new decks. Humidity Skate Shop in New Orleans is run by a master. Located in the French Quarter of the city, you’ll be stoked when you stop in and see the sick decks and accessories. Open every day from 11 a.m. to 7 p.m. except on Sunday when they close at 6 p.m., this shop does skateboarding. No more and nothing less. They’ll take care of you right and do a solid search to find what you need. Drop by Drop In BMX and Skate Shop located in Kenner, Louisiana for the best help and the best deals on bikes and boards from manufacturers like Habitat and Alien Workshop. Great deals are always on for T-shirts, shoes, hats, socks, shin guards, and helmets. No matter how old you are, remember to get your protection when you drop in at Drop In. 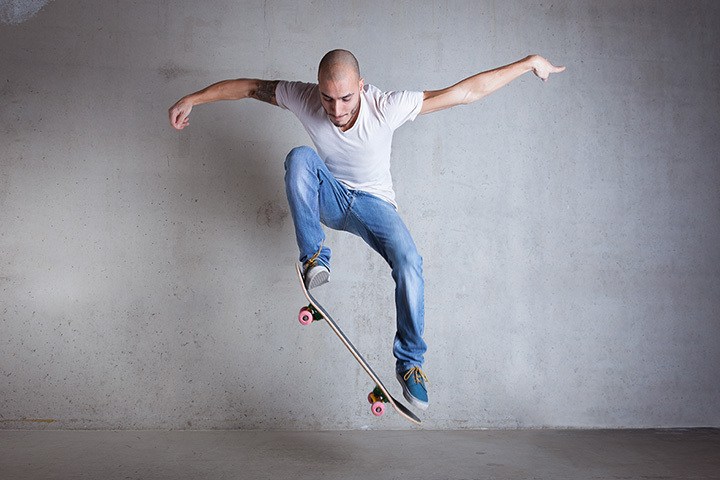 Alexandria, Louisiana is home to Dymka Shop, a sports and recreation store that specializes in fast friendly help for all things related to skateboarding. Featuring brands like Thrasher, Baker, Santa Cruz, and Deathwish, star a conversation with fellow skaters and you’ll roll away knowing you found a great place for quality and selection. Don’t let the small size of this store fool. What they lack in size, they more than make up for in quality merchandise and great customer service. Westbank Hobbies in Marrero, Louisiana specializes in skateboards, RC air planes, boats, cars, trucks, and drones. A family-owned business since 2006, they’re open Tuesday through Saturday and have worked hard to create a helpful and friendly store where you can find what you need in their well-stocked store. The brands typically in stock for skateboards include Alien Workshop, Baker, Birdhouse, Blind, Bones, Plan B and more. Lafitte Skate Shop in Mandeville, Louisiana, is a great place to find cool local brands and plenty of expertise. Skate on in any day of the week and talk to the knowledgeable folks there. Pick up a new Volcom T to wear while you’re out and about and check back often to see the new wheels, trucks, and decks when they come in. Opened in 2004, B&P Skate Shop in Deridder, Louisiana specializes in the best boards, in-line skates, and accessories. It’s hard to be a good skate shop, but when you treat your customers right, word spreads.